My Butterfly Bookmark is a coloring worksheet that you can print out for your child to color. Coloring the various parts of a butterfly helps develop kindergartners’ creativity, motor skills and fosters a sense of color and shape. 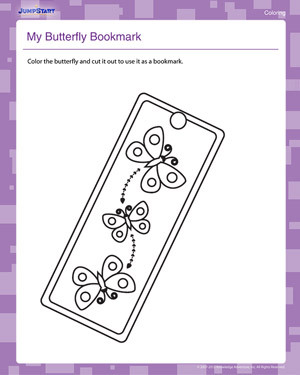 After coloring the butterfly, your little one can cut it out and use it as a bookmark. Who knows, it might even pique his interest in butterflies and books!